Most cherry tomato varieties grow to be huge plants, so they’re generally not suitable for container gardening. Determinate cherry varieties are exceptions however, as they're almost bred exclusively for container gardening. When transplanting cherry tomato plants into the garden, remove all but the top set of leaves on the plant and bury the entire stem all the way up to those leaves. This is step is important in growing cherry tomatoes, because it will establish a bigger root formation for the yet-to-be-huge plants. The entire stem that was burrowed will develop into one big root from which side roots are spawned. This will allow the plant to gather additional nutrients in the ground as well as make it stronger. Tomato cages are recommended for growing cherry tomatoes because they will help capitalize on plant size and fruit production. A primitive cage can be homemade from fencing material or PVC pipes. A properly sized cage should be at least two feet across and six feet tall. Other types of support like stakes could also be used, but whatever you do use, be sure to set them up early- driving stakes into the plant roots right when they're about to fruit is not a very good idea! 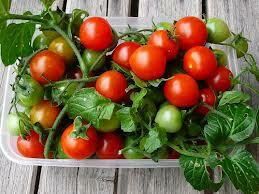 Most cherry tomatoes varieties are extremely prolific, so fertilize often and regularly, about every 2 weeks or so. Water-soluble fertilizers like MiracleGro penetrate deep into the ground to maximize nutrient uptake from the roots. Thus they’re the easiest fertilizers to use when growing cherry tomatoes. Increase fertilization when the fowers first set to increase fruit production. We all know that cherry tomatoes make fabulous snacks when picked fresh out of the garden, but they also taste great when preserved. Dried cherry tomatoes are prepared by cutting each tomato in half and adding salt and seasoning (if desired). The tomato halves are then dried in a dehydrator, after which they could be stored for quite a while. Dehydrators take the water content out of the tomatoes to make them preservable. The process also condenses tomato flavor, making dried tomatoes intensely flavorful. If you think fresh tomatoes taste good, then just wait until you taste them dried! Regular dried cherry tomatoes can be preserved in olive oil and are great for Italian cuisine. Super sweet varieties like Sun Gold and Sweet Hundred taste almost like raisins when dried and are great for snacking. All in all, the experience of preserving your own harvest makes all serve to make growing cherry tomatoes more enjoyable.